Gutter Books has finally begun kicking out collections and novels and we aren’t going to stop any time soon. Available as of June is The Baddest of the Bad, a short story anthology featuring the most dangerous fiction and nonfiction from the first three issues of Out of the Gutter magazine. If you missed the impossible-to-get Issue 1 or just haven’t sampled Gutterish fiction yet, this is the book you need. Our very worst, by which we mean our very best, stories from crime fiction’s very worst, by which we mean very best, up-and-coming and established authors are in here, all arranged by read time the way you like them! You can get this book through Amazon, Barnes and Noble, direct from our home offices in the meth capital of the West, or for your Kindle device, by clicking HERE. 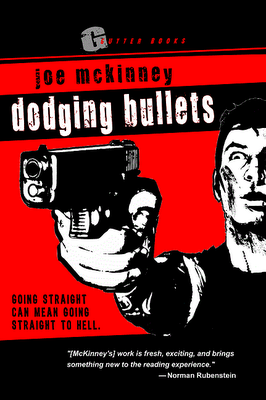 And, at long last, it’s our first original novel, Stoker-nominated horror author Joe McKinney’s Dodging Bullets! Reviewing this book, John Neal of The Celebrity Café says, “[McKinney’s] prose is descriptive and powerful, and is often a sucker punch to the gut that knocks the wind out of you. Best of all, McKinney knows how to keep the tension coming . . . Dodging Bullets is full of twists and spins that keep you glued to the page.” It’s the story of Peto Hurst, a low level heroin dealer who decides to pull a fast one on the Mexican Mafia in an attempt to please his rich girlfriend. Things start out bad and don’t go anywhere but down. You can order the book from a variety of sources and in various formats by clicking HERE, and read the Joe McKinney interview HERE! You can also read the complete behind-the-scenes story on how DODGING BULLETS was written HERE. But wait, there’s more! We also have On The Make, a brutal standalone novel from the magnificent John D. MacDonald. Talbert Howard is a disillusioned Korean War vet hunting down sixty grand in embezzled funds that he learned about from a dying friend in a POW camp. The only problem is that Earl Fitzmartin, a nearly superhuman psychopath, is hunting for the same money and taking no prisoners in the process. . . . Before he began the Travis McGee series, John D. MacDonald produced lightning-paced one-off pulp thrillers by the dozen, and nobody is spared in this early 50s masterpiece. Our edition comes with two scholarly essays for the complete reading experience. Preorders are going out this week and you still have a few more days to get free shipping by going HERE and ordering from the preorder button. Also in the works is The Wrong Man, a vicious, regular guy revenge tale, The Prison Chronicles, humorous, violent and absurd prison essays edited by Seth Ferranti and Matthew Louis, and of course, Out of the Gutter 7, the U.S. vs. U.K. issue! As a final note, The Flash Fiction Offensive is once again publishing on a regular basis with Bryon Quertermous running the show and aggressively bringing in new and exciting work. Go check it out. Don’t forget to follow our News and Events Blog and to friend us on Facebook, and don’t be shy about leaving some kind words about our offerings on Amazon! My good friend, Matt Cardin, sent this poster to me. The Dark Mirror is the brainchild of Matt Cardin, of McLennan Community College, and Dr. Jim Kendrick, of Baylor University. Our panel discussion will of course be wide-ranging, but we’ll be giving special attention to the way horror movies serve as dark reflections of their times. I’m really excited to a part of this one.